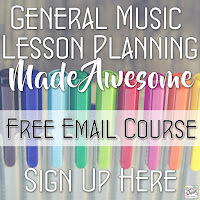 Today I'm on the 9th and final (for now) installment of my series on lesson idea for music from around the world. If you've missed any, be sure to check out the rest of the posts by clicking on the links in the list at the end of this post. So far I've talked about Brazil, Mozambique, China, Native American, Phillippines, Ireland, Maori (New Zealand), and Bolivia. Today's focus is Japan! Some of you may know that I actually grew up in Japan. I went to Japanese public school until high school and consider Japan my home. And yes, I am fluent in Japanese. What I'm hesitant to admit is that I don't currently include it as one of my countries of focus for any of the 7 grade levels I teach. Rather than teaching a cursory overview of lots of different cultures, I like to focus on one country or culture in each grade level and study their music for a month or so in the spring. There are a few reasons why Japan is not currently one of those countries- not the least of which is I choose the countries on which to focus with each grade based on the concepts I can naturally cover through the study of the music- but I do incorporate Japanese music into my classroom quite a bit, as you might imagine. Today I'm going to share my ideas as I would present it in a unit of focus, which I have done in past years, but keep in mind that these lessons can also be taught separate from each other as more isolated lessons (as you could do with any of the countries of focus I have shared in previous posts). Another great simple song is "Kaeruno Uta". I like to introduce the song by telling students that the song is a Japanese song about frogs, and to listen to see if they can hear what sound a frog makes in Japanese. You can see the lyrics, translation, and recordings here on Mama Lisa's site. Once the students learn the song, I assign an instrument to "gero" and another to "gwa"- usually a ratchet, guiro, or other "froggy" sound! Students take turns playing their instrument when they hear their word. The next step is to sing it in canon (round). Each part enters every 2 measures. This is a great song for introducing canon singing, because it has a simple melody that is easy to follow. I use one of those songs as a simple and quick introduction, depending on the age, and then spend a little more time on another song. There are so many songs I love to use that it's hard to choose, but "Donguri Korokoro" is great for introducing and practicing "syncopa" (eighth-quarter-eighth), "Ame Ame" is a great song for practicing 6/8 time (compound meter), and "Akatonbo" is another great (slightly more challenging) song to practice singing in canon, as well as teaching 3/4 time / triple meter (and happens to be one of my most favorite songs ever- it is so lovely). 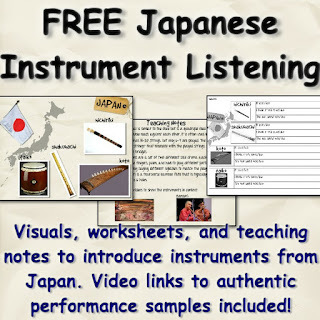 Click on the titles of each song to see the visuals, sound recordings, instrumental accompaniment parts for students to play, teaching aids, background information, and more for each one (the "Donguri" one is a free sampler!). Of course there are tons more songs to sing that are great for teaching a variety of concepts, but I'll stop with those for now. 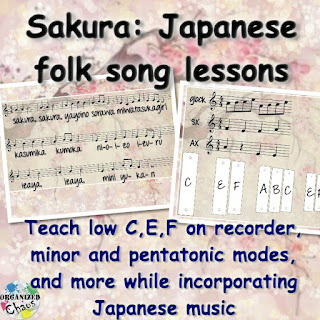 You can find recordings, information, sheet music, and more for lots of Japanese songs here on Mama Lisa's site- most of them use a pentatonic scale so they are great for introducing the scale itself and lend themselves to easy Orff accompaniment parts, and many are in triple meter so you can practice singing/playing/moving in 3/4. I've done "Sakura" in the past without these visuals and notated parts as well- I have done the song with students as young as first grade to introduce the concepts of accompaniment, improvisation, and/or pentatonic scales by having students create their own accompaniment pattern (2-4 beats long) using barred percussion instruments with the D and G bars removed. You can even layer several students' patterns on top of each other to create an ethereal effect that fits well with the theme of cherry blossom petals floating through the sky. With younger students, who would need quite a bit of time to learn the lyrics and/or melody, I will have them play the accompaniment patterns while I sing and/or play the melody on recorder. After we've done some singing and playing, it's time for some Bon odori! "Bon odori" is the name of a type of dance that Japanese people do at summer festivals. Every region of Japan has a different set of dances that they do, each associated with a particular song. Most of them are danced in a circle, usually around a tower in the center of the festival where the taiko drummer(s) (and usually some lead dancers) perform. The dances are usually just a few moves that repeat over and over, usually with some different arm movements while slowly stepping around the circle. Besides the pretty foreign-sounding instrument timbres, I also like to discuss with my older students the comparatively flat / blank affect of the performers of the gagaku music. We discuss how beauty and feeling are expressed differently in different cultures, and how in Japanese culture it would be considered "showy" and even selfish to show a lot of emotion while performing (but that doesn't mean they aren't communicating feeling through their performance)! For upper elementary and middle school students, it is really interesting to look at traditional performances from different cultures and compare the ways they express the feeling of the music through their performance. 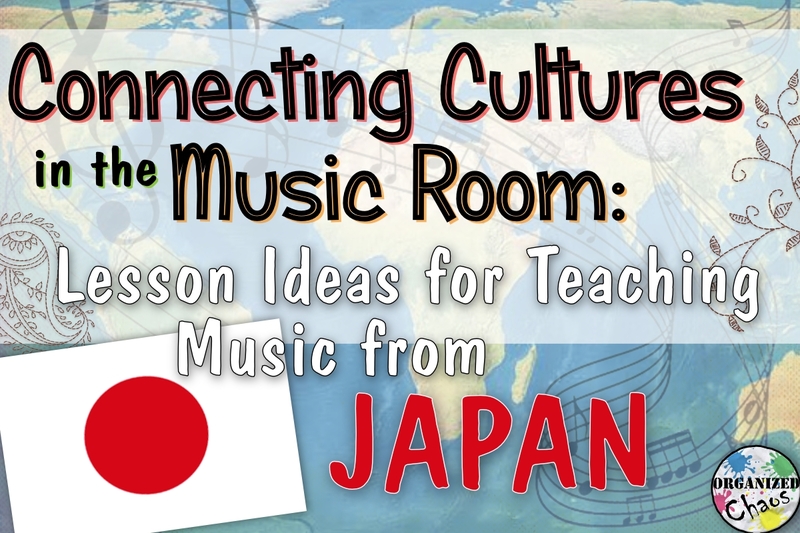 I hope these ideas and resources give you the inspiration and the tools to experience the music of Japan with your students! 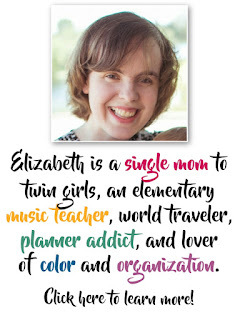 And of course, I am more than happy to answer questions or provide additional help if you are unsure about how to pronounce, teach, or perform something- this is my number one passion! Leave a comment or send me an email! If you have any additional ideas or resources that you use in your classroom, please share them in the comments below as well. I think you totally would, actually :) You two should take a trip there together!